Odd Thomas (Yelchin) tells the story of a short-order cook with clairvoyant abilities. Maybe he has a gift, maybe it's a curse, Odd has never been sure, but he tries to do his best by the silent souls who seek him out. Sometimes they want justice and he finds himself helping police solve a crime. Occasionally, they prevent one. One day, however, a mysterious man comes to town with a filing cabinet stuffed with information on the world's worst killers and a pack of hyena-like shades that follow him wherever he goes. Who the man is and what he wants, not even Odd's deceased informants can tell him. What happens next is a mysterious battle between light and darkness. 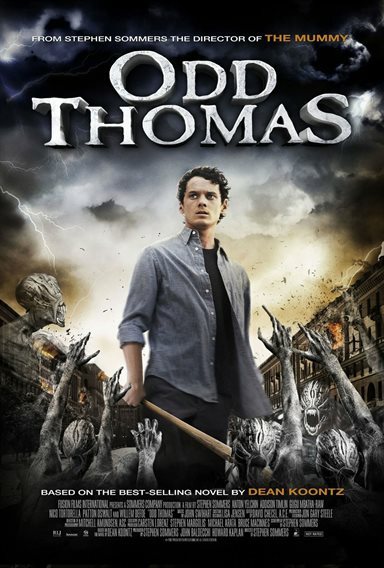 Download Odd Thomas in Digital HD from the iTunes store. Odd Thomas images are © Image Entertainment. All Rights Reserved. Awesome book series. Glad Lionsgate picked it up.